Addictive Behaviors is an international peer-reviewed journal publishing high quality human research on addictive behaviors and disorders since 1975. The journal accepts submissions of full-length papers and short communications on substance-related addictions such as the abuse of alcohol, drugs and nicotine, and behavioral addictions involving gambling and technology. We primarily publish behavioral and psychosocial research but our articles span the fields of psychology, sociology, psychiatry, epidemiology, social policy, medicine, pharmacology and neuroscience. While theoretical orientations are diverse, the emphasis of the journal is primarily empirical. That is, sound experimental design combined with valid, reliable assessment and evaluation procedures are a requisite for acceptance. However, innovative and empirically oriented case studies that might encourage new lines of inquiry are accepted as well. Studies that clearly contribute to current knowledge of etiology, prevention, social policy or treatment are given priority. Scholarly commentaries on topical issues, systematic reviews, and mini reviews are encouraged. We especially welcome multimedia papers that incorporate video or audio components to better display methodology or findings. 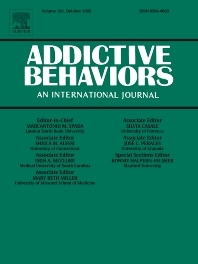 Addictive Behaviors Reports, an open-access journal for research in addictive behaviors.